Abstract: Nucleic acid testing has revolutionized the diagnosis of pertussis in the clinical microbiology laboratory and has become the main avenue of testing for pertussis infection. Real-time polymerase chain reaction (RT-PCR) is an important tool for timely diagnosis of pertussis and is more sensitive than culture. The most commonly amplified targets are the insertion-sequence (IS) genes, which are found in multiple copies in the genome of Bordetella species. Some strains of Bordetella pertussis have more than 200 copies of IS481 in their genome. This high number of repeats allows RT-PCR assays to be very sensitive and makes nucleic acid testing two to three times more sensitive than culture. Despite these advantages, RT-PCR can give inaccurate results due to contamination or lack of specificity. Contamination can easily happen during specimen collection, DNA extraction, or nucleic acid amplification steps. To avoid contamination, laboratories need to have quality controls and good workflows in place. The poor specificity of the nucleic acid assays amplifying the IS genes is because they are found in various Bordetella species and, thus, not unique to a specific species. Bordetella holmesii, a more recently described Bordetella species found to be responsible for respiratory symptoms similar to pertussis in adolescents and adults, can be misidentified as B. pertussis in RT-PCR assays that amplify only the IS481 target. Use of multiple targets may improve specificity of RT-PCR assays for pertussis. In the past few years, the US Food and Drug Administration has cleared three commercial assays for the detection of B. pertussis in respiratory specimens. Several commercial assays and analyte-specific reagents, which are not US Food and Drug Administration cleared, are available for the detection of one or more Bordetella species by nucleic acid testing. Because of the diversity of nucleic acid amplification assays used, pertussis testing is not standardized across clinical laboratories. There are two different approaches to the diagnosis of pertussis in the laboratory: the direct approach, which consists of identifying the microorganism responsible for the disease, either by culture, direct fluorescent antibody (DFA) testing, or real-time polymerase chain reaction (RT-PCR), and the indirect approach which consists of detecting specific antibodies in the serum of infected individuals. Isolation and identification of B. pertussis is highly specific, but the recovery is low and declines with age, if the patient has received prior antibiotic therapy effective against B. pertussis, if the collection of the specimen has been delayed beyond the first 2 weeks of illness, and if the patient has been vaccinated.11 However, culture is particularly useful for confirming pertussis diagnosis when an outbreak is suspected and allows for strain identification and antimicrobial resistance testing. RT-PCR is more sensitive than culture and has been accepted as evidence of laboratory confirmation of pertussis in different countries (examples: USA and Canada). It is still recommended to send specimens for culture, particularly during outbreaks, as bacterial isolates may be required for evaluation of antibacterial resistance or epidemiologic studies. RT-PCR is able to detect the organism at a later stage of the infection, when the ability to culture the organism declines. Serology consists of detecting specific anti-pertussis toxin (PT) antibodies in the serum of infected individuals after 2–3 weeks of the cough. Serology testing should not be used in infants, as their immune systems are immature and susceptible to interference by maternal antibodies, or in patients who have been vaccinated within 1 year since it does not differentiate between antibodies due to the vaccine and natural infection. Generally, serologic tests are more useful for diagnosis in later phases of the disease when it is too late to perform culture or nucleic acid amplification testing (NAAT). Other antibodies to pertussis antigens are not routinely available but are usually included in pertussis vaccine trials (eg, anti-filamentous hemagglutinin, anti-fimbriae, anti-pertactin). A battery of antibody tests may be advantageous rather than just anti-PT. RT-PCR has revolutionized the way clinical laboratories diagnose B. pertussis. NAAT is a rapid and sensitive way to detect B. pertussis from upper respiratory samples. It does not require viable bacteria for detection. This permits the use of more diverse collection devices and simplifies the transport and storage of specimens for pertussis testing. RT-PCR has an optimal sensitivity during the first 3 weeks of illness when bacterial DNA is still present in the nasopharynx.12 One study showed that the bacterial DNA could be detected by RT-PCR up to 58 days into illness even after antimicrobial therapy.13 Nevertheless, after the fourth week of cough, the amount of bacterial DNA rapidly diminishes and might be too low to be detected by NAAT, and thus, serology (IgA or IgG anti-PT or other antibody testing) is recommended. Notes: aHolmesii IS1001; bpertussis toxin S1 promotor, also known as ptxP. Because pertussis NAATs are not standardized across clinical laboratories, the results may not be comparable from one laboratory to another. Different testing methods, amplification targets, and result interpretation are used to determine positive, indeterminate, or negative results. Until a few years ago, there were no US Food and Drug Administration (FDA) cleared NAATs for B. pertussis or other Bordetella species. 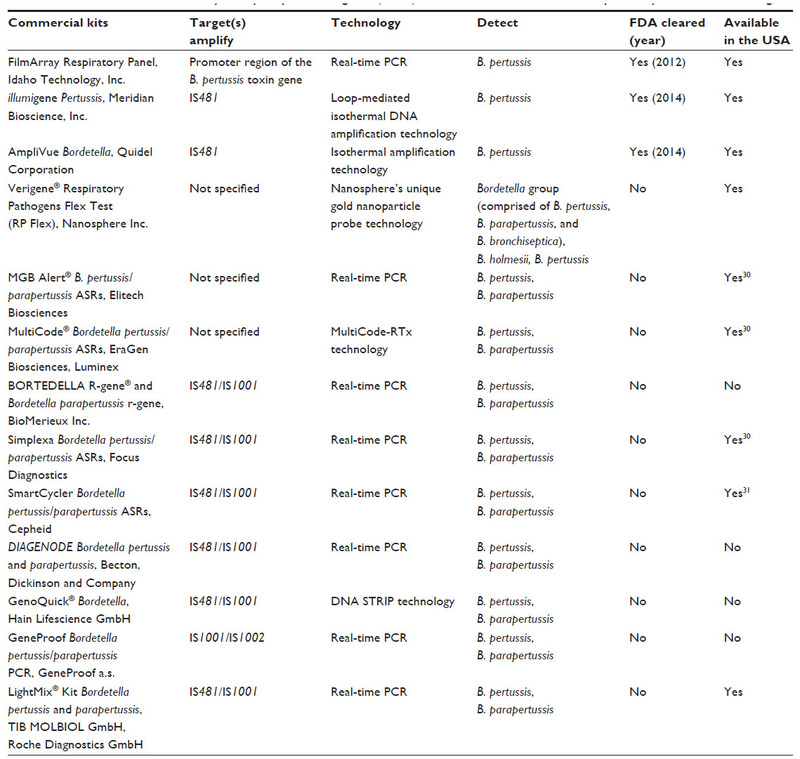 In the last 4 years, the FDA approved three commercial NAATs for rapid B. pertussis testing, but there is still no FDA-cleared assay for the detection of any other Bordetella species (Table 2). Abbreviations: FDA, US Food and Drug Administration; B. pertussis, Bordetella pertussis; PCR, polymerase chain reaction; IS, insertion sequence; B. parapertussis, Bordetella parapertussis; B. bronchiseptica, Bordetella bronchiseptica; B. holmesii, Bordetella holmesii. In May 2012, Idaho Technology, Inc., was the first to receive FDA clearance for RT-PCR testing of B. pertussis for its FilmArray Respiratory Panel. It targets the single-copy promoter region of the pertussis toxin gene that is specific for B. pertussis. The product insert reports a sensitivity of 4,000 CFU/mL (~450 CFU/reaction). In March 2014, Meridian Bioscience, Inc., Cincinnati, OH, USA, received FDA clearance for its new molecular diagnostic test for B. pertussis, on the illumigene® molecular platform. The illumigene Pertussis assay utilizes loop-mediated isothermal DNA amplification technology to detect B. pertussis by targeting the IS481 insertional element of the B. pertussis genome. It claims a sensitivity of 3,265 CFU/mL (1.48 CFU/test). The product insert includes this disclaimer “Respiratory infection with B. pertussis, B. holmesii, or B. bronchiseptica may yield positive test results in IS481 assays”. In December 2014, Quidel Corporation received clearance from the FDA for its AmpliVue Bordetella assay for the detection of B. pertussis nucleic acids isolated from nasopharyngeal swab specimens. The assay utilizes an isothermal amplification technology of helicase-dependent amplification of the insertion sequence IS481. The assay limit of detection for B. pertussis is 2,358 CFU/mL (3.93 CFU/assay). The product insert mentions cross-reactivity with B. bronchiseptica and B. holmesii. Automation has become part of molecular testing, and many laboratories are using automated platforms to extract bacterial DNA from respiratory samples, but manual extraction using extraction kits or simple hit lysis are still performed. Not all extraction methods have the same efficiency to extract bacterial DNA, and a comparison between the different methods has yet to be performed to assess the efficiency of each method.32 Manual extraction increases the possibility of DNA cross-contamination. Hit lysis is a very efficient technique to release DNA but does not remove potential PCR inhibitors, and an internal control needs to be added to the RT-PCR reaction to monitor the presence of any PCR inhibitor. The use of RT-PCR to diagnose pertussis has improved the sensitivity of diagnosis and decreased the turnaround time to diagnosis, permitting faster treatment and prophylaxis of contacts. It has extended the window period in which testing for pertussis is still reliable up to 58 days into illness.13 Antibiotics do not affect the result of the RT-PCR assays. RT-PCR testing has given us a new understanding of the epidemiology of pertussis in the adolescent and adult population and, thus, has provided better control and prevention of outbreaks. The consequence of miscalling a Bordetella species has not been fully investigated. The significance and the health impact of the detection of B. holmesii in healthy individuals with pertussis-like symptoms are not certain. Controversy as to whether the bacterium is a mere colonizer with minimal pathogenic implication or a true respiratory pathogen is still debated.8,19 The true prevalence of B. holmesii in the population is not known. Its prevalence is difficult to evaluate because the majority of clinical laboratories are using RT-PCR assays that target only the IS481 region that does not discriminate between B. pertussis and B. holmesii. The laboratories that use RT-PCR assays which are species-specific are not attracted to identify B. holmesii because of its unknown significance. The need for a new vaccine that confers better and longer immunity than the acellular pertussis vaccine and that does not have the adverse reactions associated with the whole-cell vaccine is evident. Understanding the epidemiology of pertussis in vaccinated groups of individuals with waning immunity is important for the design of a better vaccine. The diagnosis of pertussis in this group of individuals is challenging because of the nonspecific clinical symptoms they present with. The increased sensitivity of NAAT has permitted us to detect the bacteria in this group of people for whom culture was not sensitive enough. The problem is lack of standardization of testing and that the accuracy of diagnosis varies among laboratories. Different protocols, DNA extraction methods, nucleic acid amplification techniques, and amplification targets are used by laboratories to detect Bordetella species. These factors influence the sensitivity and the accuracy of results.32 Conformity in the diagnostic approaches to detect pertussis is desirable to have a true knowledge of the prevalence of pertussis in the population. It is imperative that laboratories assess the performance of their nucleic acid amplification assay by participating in external assessments to ensure that their results are comparable to their peers. To achieve better standardization of pertussis testing by RT-PCR, by adaptation of multiplex RT-PCR assays, one can target the IS genes (eg, IS481, IS1000) to confer high sensitivity, and single-target genes specific to Bordetella species (eg, pertussis toxin S1 promoter ptxA-pr or recABH) to achieve high specificity. Multiplex RT-PCR with primers and probes that give high sensitivity and specificity for all four major clinical Bordetella species would be ideal. World Health Organization (WHO). Pertussis vaccines: WHO position paper. Wkly Epidemiol Rec. 2010;85(40):385–400. Black RE, Cousens S, Johnson HL, et al; Child Health Epidemiology Reference Group of WHO and UNICEF. Global, regional, and national causes of child mortality in 2008: a systematic analysis. Lancet. 2010;375(9730):1969–1987. Winter K, Glaser C, Watt J, Harriman K; Centers for Disease Control and Prevention (CDC). Pertussis epidemic – California, 2014. MMWR Morb Mortal Wkly Rep. 2014;63(48):1129–1132. Centers for Disease Control and Prevention. Epidemiology and Prevention of Vaccine-Preventable Diseases. 13th ed. Washington, DC: Public Health Foundation; 2015. Available from: http://www.cdc.gov/vaccines/pubs/pinkbook/index.html. Accessed July 2, 2015. Centers for Disease Control and Prevention (CDC). Notifiable diseases and mortality tables. MMWR Morb Mortal Wkly Rep. 2015;63:733–746. Cherry JD. Historical perspective on pertussis and use of vaccines to prevent it. Microbe. 2007;2(3):139–144. Cherry JD. Epidemic pertussis in 2012 – the resurgence of a vaccine-preventable disease. N Engl J Med. 2012;367(9):785–787. Pittet LF, Emonet S, Schrenzel J, Siegrist CA, Posfay-Barbe KM. Bordetella holmesii: an under-recognised Bordetella species. Lancet Infect Dis. 2014;14(6):510–519. Aricò B, Rappuoli R. Bordetella parapertussis and Bordetella bronchiseptica contain transcriptionally silent pertussis toxin genes. J Bacteriol. 1987;169(6):2847–2853. Wirsing von König C-H, Riffelmann M, Coenye T. Bordetella and related genera. In: Versalovic J, Carroll KC, Jorgensen JH, Funke G, Landry ML, Warnock DW, editors. Manual of Clinical Microbiology. Vol 1. 10th ed. Washington, DC: ASM Press, Inc.; 2011:739–750. Faulkner A, Skoff T, Martin S, et al; Centers for Disease Control and Prevention. Pertussis. In: Manual for the Surveillance of Vaccine-Preventable Diseases. Atlanta, GA: Centers for Disease Control and Prevention; 2012. Available from: http://www.cdc.gov/vaccines/pubs/surv-manual/chpt10-pertussis.html. Accessed July 2, 2015. Palmer CM, McCall B, Jarvinen K, Nissen MD. Bordetella pertussis PCR positivity, following onset of illness in children under 5 years of age. Commun Dis Intell Q Rep. 2007;31(2):202–205. Stone BL, Daly J, Srivastava R. Duration of Bordetella pertussis polymerase chain reaction positivity in confirmed pertussis illness. J Pediatric Infect Dis Soc. 2014;3(4):347–349. Harvill ET, Goodfield LL, Ivanov Y, et al. Genome sequences of nine Bordetella holmesii strains isolated in the United States. Genome Announc. 2014;2(3):e00438-14. Loeffelholz M. Towards improved accuracy of Bordetella pertussis nucleic acid amplification tests. J Clin Microbiol. 2012;50(7):2186–2190. Tizolova A, Guiso N, Guillot S. Insertion sequences shared by Bordetella species and implications for the biological diagnosis of pertussis syndrome. Eur J Clin Microbiol Infect Dis. 2013;32(1):89–96. Van der Zee A, Vernooij S, Peeters M, van Embden J, Mooi FR. Dynamics of the population structure of Bordetella pertussis as measured by IS1002-associated RFLP: comparison of pre- and post-vaccination strains and global distribution. Microbiology. 1996;142(pt 12):3479–3485. Antila M, He Q, de Jong C, et al. Bordetella holmesii DNA is not detected in nasopharyngeal swabs from Finnish and Dutch patients with suspected pertussis. J Med Microbiol. 2006;55(pt 8):1043–1051. Guthrie JL, Robertson AV, Tang P, Jamieson F, Drews SJ. Novel duplex real-time PCR assay detects Bordetella holmesii in specimens from patients with pertussis-like symptoms in Ontario, Canada. J Clin Microbiol. 2010;48(4):1435–1437. Riffelmann M, Wirsing von König CH, Caro V, Guiso N; Pertussis PCR Consesus Group. Nucleic acid amplification tests for diagnosis of Bordetella infections. J Clin Microbiol. 2005;43(10):4925–4929. Njamkepo E, Bonacorsi S, Debruyne M, Gibaud SA, Guillot S, Guiso N. Significant finding of Bordetella holmesii DNA in nasopharyngeal samples from French patients with suspected pertussis. J Clin Microbiol. 2011;49(12):4347–4348. Litt DJ, Jauneikaite E, Tchipeva D, Harrison TG, Fry NK. Direct molecular typing of Bordetella pertussis from clinical specimens submitted for diagnostic quantitative (real-time) PCR. J Med Microbiol. 2012;61(pt 12):1662–1668. Qin X. Resurgence of pertussis and its laboratory diagnosis. Clin Microbiol Newsl. 2015;37(9):69–76. Centers for Disease Control and Prevention (CDC). Pertussis – United States, 2001–2003. MMWR Morb Mortal Wkly Rep. 2005;54(50):1283–1286. Kretsinger K, Broder KR, Cortese MM, et al; Centers for Disease Control and Prevention; Advisory Committee on Immunization Practices; Healthcare Infection Control Practices Advisory Committee. Preventing tetanus, diphtheria, and pertussis among adults: use of tetanus toxoid, reduced diphtheria toxoid and acellular pertussis vaccine recommendations of the Advisory Committee on Immunization Practices (ACIP) and recommendation of ACIP, supported by the Healthcare Infection Control Practices Advisory Committee (HICPAC), for use of Tdap among health-care personnel. MMWR Recomm Rep. 2006;55(RR–17):1–37. Jerris RC, Williams SR, MacDonald HJ, Ingebrigtsen DR, Westblade LF, Rogers BB. Testing implications of varying targets for Bordetella pertussis: comparison of the FilmArray Respiratory Panel and the Focus B. pertussis PCR assay. J Clin Pathol. 2015;68(5):394–396. Cloud JL, Hymas W, Carroll KC. Impact of nasopharyngeal swab types on detection of Bordetella pertussis by PCR and culture. J Clin Microbiol. 2002;40(10):3838–3840. Arbefeville S, Ferrieri P. Comparison of rates of positivity for Bordetella pertussis by real-time PCR between specimens collected with rayon swabs on aluminum wire shaft in Amies gel with charcoal and specimens collected with flocked swabs in universal viral transport medium during an epidemic. J Clin Microbiol. 2014;52(7):2656–2658. Lanotte P, Plouzeau C, Burucoa C, et al. Evaluation of four commercial real-time PCR assays for detection of Bordetella spp. in nasopharyngeal aspirates. J Clin Microbiol. 2011;49(11):3943–3946. Hassan F, Hays L, Bell J, Selvarangan R. Evaluation of 3 analyte-specific reagents for detection of Bordetella pertussis and Bordetella parapertussis in clinical specimens. Diagn Microbiol Infect Dis. 2014; 80(3):181–184. Arbefeville S, Levi MH, Ferrieri P. Development of a multiplex real-time PCR assay for the detection of Bordetella pertussis and Bordetella parapertussis in a single tube reaction. J Microbiol Methods. 2014;97:15–19. Williams MM, Taylor TH, Warshauer DM, Martin MD, Valley AM, Tondella ML. Harmonization of Bordetella pertussis real-time PCR diagnostics in the United States in 2012. J Clin Microbiol. 2015;53(1):118–123. Mandal S, Tatti KM, Woods-Stout D, et al. Pertussis pseudo-outbreak linked to specimens contaminated by Bordetella pertussis DNA from clinic surfaces. Pediatrics. 2012;129(2):e424–e430. Guthrie JL, Seah C, Brown S, Tang P, Jamieson F, Drews SJ. Use of Bordetella pertussis BP3385 to establish a cutoff value for an IS481-targeted real-time PCR assay. J Clin Microbiol. 2008;46(11):3798–3799. Papenburg J, Fontela P. What is the significance of a high cycle threshold positive IS481 PCR for Bordetella pertussis? Pediatr Infect Dis J. 2009;28(12):1143; author reply Waters V, et al. 1143–1144. Cherry JD. Tetanus-diphtheria-pertussis immunization in pregnant women and the prevention of pertussis in young infants. Clin Infect Dis. 2015;60(3):338–340. Cherry JD. Pertussis: challenges today and for the future. PLoS Pathog. 2013;9(7):e1003418. Warfel JM, Papin JF, Wolf RF, Zimmerman LI, Merkel TJ. Maternal and neonatal vaccination protects newborn baboons from pertussis infection. J Infect Dis. 2014;210(4):604–610. Centers for Disease Control and Prevention (CDC). Updated recommendations for use of tetanus toxoid, reduced diphtheria toxoid, and acellular pertussis vaccine (Tdap) in pregnant women – Advisory Committee on Immunization Practices (ACIP), 2012. MMWR Morb Mortal Wkly Rep. 2013;62(7):131–135.